Trends emerging in the household sector are becoming concerning, despite solid employment growth. The absence of an acceleration of wages growth, weak overall income growth and higher costs of living has seen consumer confidence remain subdued. This has driven two consecutive declines in retail sales in July and August of 0.2% and 0.6% respectively – the latter being the weakest single month result since March 2013. Combined with the annual rate of growth decelerating to 2.1%yoy, the weakest rate since June 2013, it is difficult to envisage as significant a contribution to September quarter GDP from retail spending as there was in the June quarter. This is unless the September outcome is very strong and/or these nominal monthly declines have been due to aggressive price discounting. Also reflecting some household caution is a deceleration of dwelling price growth. Capital city median dwelling price growth decelerated to 8.5%yoy in September. Macroprudential measures are likely to have taken the edge off the investor side of the market, but poor affordability, despite still record low interest rates, remains the key driver. Households have become ever more wary of taking on too much debt at what is increasingly appearing to be the top of a very expensive market based on any metric. 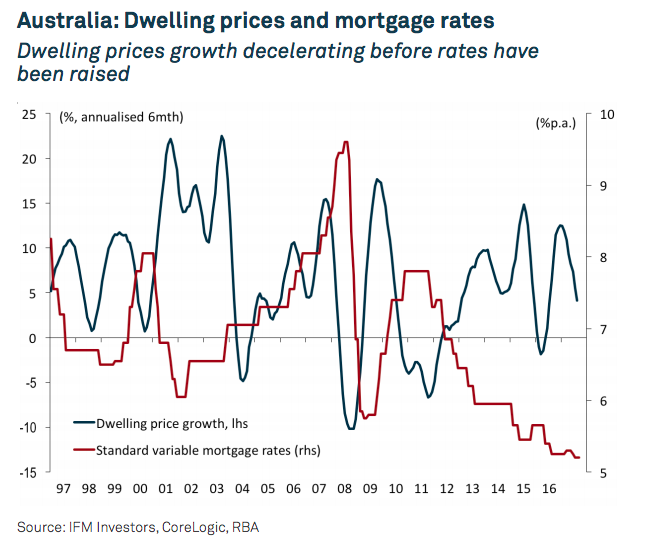 It seems clear that with both structurally and now cyclically low interest rates capitalised into house prices any move to raise rates from record lows will potentially weigh heavily on price growth going forward. This is particularly true if household income growth remains so tepid. The Reserve Bank of Australia’s (RBA) next tightening cycle, whenever it begins, will gradually remove the ability of households to leverage over an extended period. Therefore it would not be difficult to envisage dwelling prices over this period experiencing little to no growth, or perhaps even seeing orderly declines. How investors react to such a scenario is an open question, especially new investors that are negatively geared. There is also the dampening impact on household spending this would have via a potential negative wealth effect. Nonetheless, for now, housing credit growth remains at a solid 6.6%yoy. Updated data from the RBA show that, as this rate is still running well ahead of income growth, the household debt-to-income ratio has risen again to 193%. In our view, this leaves the RBA with a hugely asymmetric policy tool. When the RBA does seek to lift rates, it will do so with caution as not to overly impact indebted households and limit spending growth. It is for this reason, amongst others, we think the RBA will not raise rates for some time to come, waiting for wage growth to pick up. It will want to be sure that household can weather the increases. The Bank will be looking for dwelling price growth to continue to decelerate to buy it the necessary time. There seems no advantage in getting ahead of itself. Inflation is not threatening to break out, and going too early would only bring unwelcome appreciation of the exchange rate. Getting behind the curve may risk debt metrics deteriorating further which is concerning, but it is seemingly a prudent course given the uncertainty of the economic outlook. Couldn't agree more with your balanced assessment - nicely said.